What About Our Daughters? : What About Our Daughters Wins Battle!!! What About Our Daughters Wins Battle!!! My name is Bronze Trinity. I am a graduate student and a member of the Afrosphere Bloggers Association. 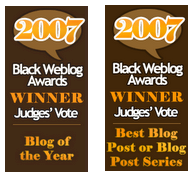 I will be guest blogging here for a while to keep fighting againist negative representations of Black women. My first post my impression of what has happened this week. What About Our Daughters has won the BET battle! What was once a disgrace and offense to the Black community is no longer offensive! 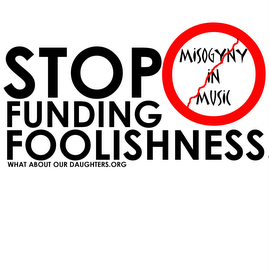 Based on the activism and drive of one fantastic blogger, Gina McCauley of What About Our Daughters blog (WAOD) the offensive title was changed and all offensive material was removed from the show. THAT MEANS WAOD WON! No the show was not canceled but the show that aired was no longer offensive. The whole point of the protest was to stop an offensive show from being aired that would insult and spread stereotypes about Black people. In actuality, that offensive show NEVER AIRED! Its was CANCELED! What they aired instead was a version with the offensive title and content removed. I think that the fact that the show's content had to be edited actually proves that there was a lot of offensive material in the original show. If the show was a poignant social commentary to begin with then there would have been nothing to edit in the first place. What was left was just disjointed video segments. It didn't lift anyone up or inspire anyone to do better. It was a piece of crap! At first I was worried that people were bringing too much attention to the show and actually giving it publicity. What if it had actually been a good show? Fortunately it was garbage, many people, the media, and critics saw the garbage and are now in the process of writing negative reviews. This negative publicity would not have been generated if WAOD did not bring attention to the show. It is taking attention away from BET's other shows! I hope that this finally motivates them to change the type of programming they carry. I also hope that channels like TVONE, that provide better programming, can capitalize of this by getting new subscribers! Understand this, one blogger with vast activism skills stood up against a television corporation and stopped an offensive show from airing. THIS IS A VICTORY!!! Please congratulate Gina because this is a victory against negative depictions of Black people in the media. The war is not over and Black bloggers are going to find creative ways to use internet activism to improve the lives of members of the African Diaspora. We are taking back our lives, confronting and dealing with our own problems, and stepping up to change things. We will fight crime, drugs, AIDS, poor education, low self-esteem, poverty, and all the problems that affect us. This was a great example of how it can be done. We will use this example to help us fight all of our problems!